Okay….so for as much as I hate to admit it, most of the time, I’m just going through the motions of life on auto-pilot. Yet, what I discover when I remember to pay attention to what I’m doing is grace. Intellectually, at least, I get that when I don’t pay attention, I miss the fullness of the experience, the taste of the wine, the tenderness of the touch, the honesty of the words, the tickle of the tooth brush, the tingle of my palm as I pet the pooch. This bringing of the mind to what you’re doing in the moment is what is often referred to as "mindfulness". Three days ago, Beth turned me onto the website www.savorthebook.com which is built around a book by Thich Nhat Hanh and Dr. Lilian Cheung dedicated to "mindful eating, mindful life". As you know from my blog, I’ve been hyper-focused on what I eat for several months. Until Beth shattered my world of sleep-walking last Friday by reminding me of mindfulness, I hadn’t stopped to think about how I eat. Instead of slowing down to taste the rewards of two hours in the kitchen, I typically eat the feast in-front of what I affectionately refer to as "mush brain" (other people call it "the TV") and barely notice whether or not the food has even been cooked. The weird thing is that when I cook, I am mindful. Absolutely mindful. 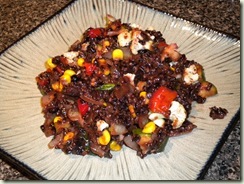 Especially when I cook weird things like Forbidden Rice, Quinoa & Celery Root. I love to be in the kitchen, completely consumed in figuring out what to do with a new ingredient, recipe, technique…I gladly devote all of me to that process and to that experience right up until it’s on a plate and a fork is in my hand. Then, my choice is DISTRACTION!! I’d rather be mindless when I eat AND I JUST DON’T GET IT! Is it habit? Laziness? Thinking that I’m being efficient by multi-tasking? My upbringing? Ironically, as a child, I absolutely loathed eating in front of the TV. 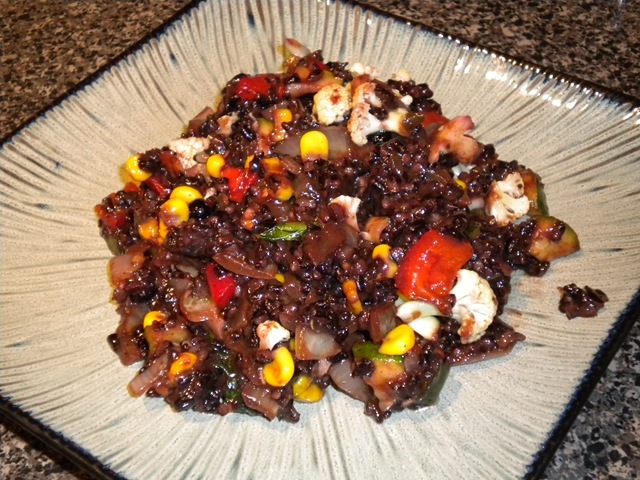 The picture is of the dinner I made tonight – a forbidden rice salad featuring huckleberries, balsamic vinegar, jalapenos and all sorts of wonderful flame roasted veggies. Sorry it doesn’t look prettier or more Zen-like. I actually set down at the table with the intention to “meet it” and wow! It was extraordinary. I would have entirely missed it had I reached for the remote. I guess this is how we come to mindfulness – one moment, one full experience at a time. » It’s one mega-umbrella out there. When do we get an invitation over for dinner, we ask? Seriously, putting some of the recipes on your blog would be great!